Please find below information from the NIPA EGM held on Sunday 22nd October 2017 in McConnells of Doagh. Jean McIlroy stood down as Treasurer. We would like to thank Jean for her time on the Committee and the commitment she gave to it. Robert Hawkins stood down as Secretary after serving 10 years in the post. Robert will be helping Gillian from the sidelines until she settles in to her new position. It was unanimously agreed that prize money for Interleague teams is to be done away with as it was agreed the prestige of your League competing in the event is the main purpose of the event. 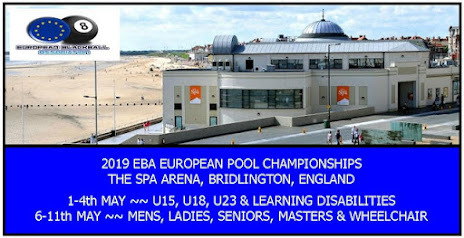 Entry fees will go towards the NIPA paying for the tables to hold the 2 days of competition in a Hotel with a large room where all the tables will be in the one room so as to create the best atmosphere rather than a split venue. Hotels to be contacted immediately to see what is available. Discussion was had and after a vote of 4-2 it was decided to charge teams entering, £10 per registered player on their team sheet. The other option was £100 per team. A proposal that this be reduced to £50 from £75 was defeated by a vote of 4-3. After discussion it was agreed this be kept at £15 per season. Payment is due before or at the next event, the Northern Ireland Individual Championships from 17-19th November. Payment for anyone entered into any of these Individual competitions is due by Saturday 11th November. It was agreed to change our march in music at International events from "We're nor Brazil" sung by Jackie Fullerton to "Sweet Caroline" by Neil Diamond. This will be effective in Malta at the EBA Nations Cup next week. Lots of discussion was had on the best way forward with the Mens Section selection as it has given lots of problems recently. Mens B Team - 4x Managers Picks, Top 4 from Trials after A Team has been confirmed. Mens B1 Team - 1x B1 Player/Manager, 2x Managers Picks, next Top 5 from Trials after B Team has been confirmed. Mens B2 Team - 1x B2 Player/Manager, next top 8 from Trials after B1 Team has been confirmed.